A reminder that this Friday (4 May) at 6pm, there is a rally to mark the anniversary of the racist murder of Altab Ali and to celebrate the anti-racist movement that grew in the East End in the late 1970s in response to his death. On 4 May 1978, Altab Ali, a 25-year-old Bangladeshi clothing worker, was murdered by three teenage boys near the corner of Adler Street and Whitechapel Road, by St Mary's Churchyard (now renamed Altab Ali Park). His death mobilised the Bangladeshi community against the National Front and led to the creation of the Bangladesh Youth Movement. 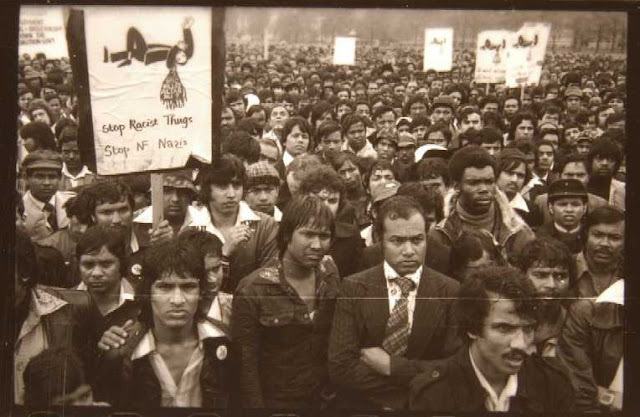 On 14 May more than 7000 people, predominantly Bangladeshis, took part in a demonstration against racial violence, marching behind Altab Ali’s coffin to Hyde Park. Speakers this Friday include Bethnal Green and Bow MP Rushnara Ali, Tower Hamlets councillor Rajonuddin Jalal, Megan Dobney (SERTUC), the Rt Revd Adrian Newman (Bishop of Stepney), the author Mike Rosen and Dan Jones.